Small and midsize retailers around the world are seeing their businesses transform in a variety of ways. Customers are seeking new types of engagement and suppliers are expecting higher levels of efficiency and effectiveness. Also, new business models and new competitors are changing the way retailers do business. Successful retailers are leveraging technology in new ways to sharpen business practices, improve agility, and better serve customers while strengthening the role of retailers in the supply chain. 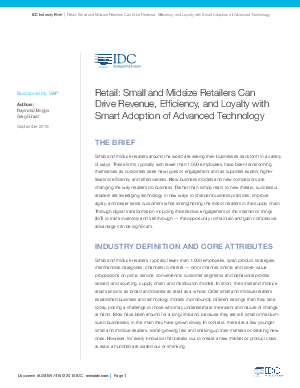 Download this white paper to learn how digital transformation, including the effective engagement of the internet of things (IoT) to track inventory, can provide opportunities to maintain and gain a significant competitive advantage in the retail industry.